<?xml:namespace prefix = o />Pre-engineered units come with all the necessary parts and hardware included. 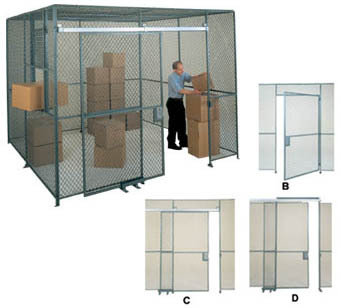 They are ideal or secured storage for work areas. They can be installed in a corner (2-sided), against a wall (3-sided) or free standing (4 sided). They have a 4' wide x 7' high reversible hinged door complete with a keyed mortise lock. Easy to order since no drawings are required. Shipped knocked down. FOB Shipping Point. Add $90.00 Crating Charge. Steel surcharge may apply. Product No. W x L Wt. (lbs.) Price Ea.